Don't Drive to Dinner: Why is life never simple? Kolache confusion! Roadfood.com - it's your fault. Up until an hour ago, the plan was simple. I'd break my drive from Dallas to Austin, down the oh-so-dull I35, at two places - West, for a quick sweet snack, then Waco for lunch. If you drive between Dallas and Austin, you'll almost certainly know about the small town of West, and the Czech Stop bakery. 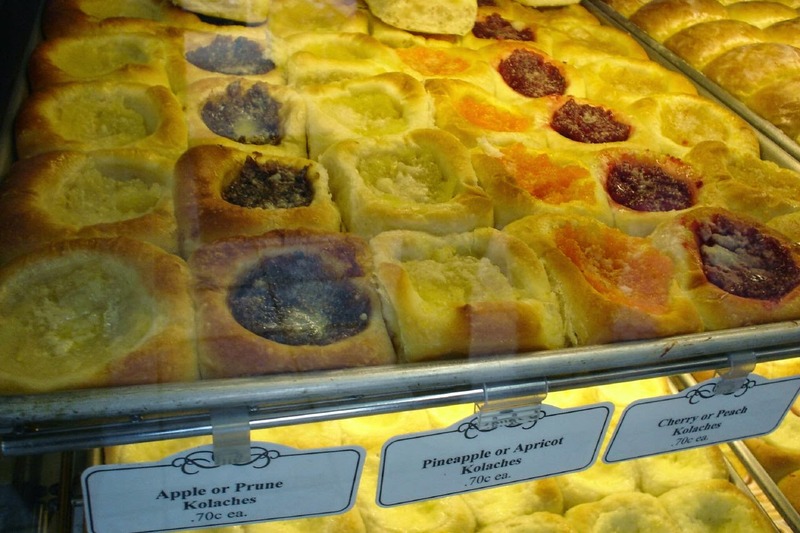 West (named after the first postmaster, not the geographical location apparently) is known for its large Czech community, and the delicacies they make - most famous of which is the kolache. These are a sweet dough bun, usually served tart fashion with a fruit filling. They're also quite addictive. I'd planned to stop there in the morning, munch a couple with a coffee, hide a few more in the car and then drive down to Waco. It was Waco I was interested in - I normally stop at a Panera Bread just off the I35, but given the foodie nature of this trip, I thought I could do better. So I was hoping that Roadfood.com might come up with some ideas. Alas, it couldn't, but it did suggest I stopped at one of the three Czech bakeries in West. Hold on a second there. Three? Oh no, this is information I can't un-know. Apparently, there's the Czech Stop, just off the I35, certainly the best known, but possibly not the best (although I've always loved it). There's the Village Bakery, where the locals buy their kolaches, and Geriks, which has a little more of a restaurant vibe, and also does great savoury kolaches. Obviously, the first thought that jumps to mind is 'taste test'. I'm not alone - Shelly Tucker experienced a similar dilemma on her blog. She gives me some very sensible advice - "don't eat six kolaches at one sitting." But when did I start listening to sensible advice? So I don't know what I'm going to do. I'm glad I now have something to liven up an otherwise dull stretch of my travels. I'm worried that I'm going to absolutely stuffed just hours into my road trip. Tune in next Sunday to find out! I can’t have the Kolaches in West because of a Soy Allergy, but I do like to visit Village Bakery for their other baked items that I can have. I’m particularly fond of their Macadamia Nut cookie. As for lunch near Waco, I can’t recommend Cafe Homestead enough. They are just north of Waco, and a few miles off the freeway, but very much worth the stopover. Hey, thanks for the tips. I'll certainly take a look at Cafe Homestead, as long as I'm not too full of Kolaches! And 200 miles *is* a long distance! From where I live in Cambridge, 200 miles would get me into Northern France!